Just for fun, I threw together a CD for her of material that was recorded during the first three months of 1928. It was a pleasant mix of pop/jazz records with a dash of blues and country too. I thought I'd share a few of the highlights with you too! NYC, 14 February 1928: Leo McConville, Fuzzy Farrar, trumpets; Tommy Dorsey, trumpet & trombone; Jimmy Dorsey, clarinet & alto sax; Arnold Brilhart, alto sax & oboe ; Herbert Spencer, tenor sax; Carl Kress, guitar; Hank Stern, tuba; Chauncey Morehouse, drums & chimes. Camden NJ, 27 March 1928: Jabbo Smith, cornet; Garvin Bushell, clarinet, alto sax & bassoon; James P. Johnson, piano; Fats Waller, organ. This whole session (http://www.redhotjazz.com/sugarbabes.html) is pretty darned amazing...I love the interplay between piano and organ (played by James P. Johnson and his protege, Fats Waller)...Jabbo Smith's trumpet is nicely understated (he was usually a lot more flamboyant), and Garvin Bushell makes full use of all three of his instruments too. I wish that they recorded more than that one session. It's time for a Whiteman cut...he led the most popular band in the 1920s...certainly the most prolific too. 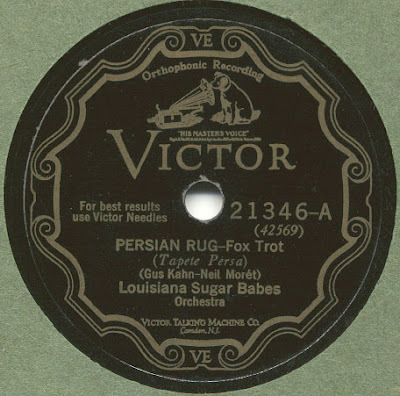 Regularly from 1927 to 1930 (and fairly often thereafter), he made some decent jazz or jazz-influenced dance records, with solos by Bix Beiderbecke, the Dorsey Brothers, Frankie Trumbauer, Jack Teagarden, and an occasional vocal by Mildred Bailey or Red McKenzie. Here's Bing, singing the verse on a record that could never be considered jazz. It's actually pretty awful...so overarranged, so overdone. But it's fun to hear him in an otherwise ridiculous setting. NYC, 16 March 1928: Large orchestra with chorus, Bing Crosby, vocal. Memphis 13 February 1928: Will Shade, guitar & vocal; Vol Stevens, banjo-mandolin; Ben Ramey, kazoo; Charlie Polk, jug; the band shouts occasionally. 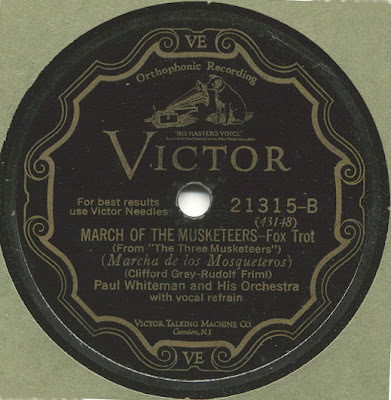 From Lee County, Mississippi, comes this string band...and a dynamite number, recorded the same day as the MJB. Memphis, 13 February 1928: Hoyt Ming, fiddle; Troy Ming, mandolin; Rozelle Ming, guitar. Catchy number...and there's a story about it here: http://www.ibiblio.org/fiddlers/IN_IO.htm and look under Indian War Whoop. If the previous record sounds familiar, it's because it was remade (by John Hartford) for the soundtrack of O Brother, Where Art Thou? Speaking of O Brother, Chris Thomas King plays a character in the movie named Tommy Johnson, who boasted of selling his soul to the Devil in exchange for his guitar artistry (the song he performed in the movie, however, is associated with Skip James, not Johnson). There really was a Tommy Johnson who told the same story...more to be found here http://www.tommyjohnsonblues.com/ . Memphis 4 February 1928: Tommy Johnson, vocal & guitar. Memphis, 24 February 1928: George Carter, vocal & fiddle; Andrew Carter, fiddle; Jimmie Carter, guitar. San Antonio 14 March 1928: Don Albert, Willie Long, trumpets; Benny Long, trombone; Troy Floyd, N. J. "Siki" Collins, Scott Bagby, reeds; Allen Vann, piano; John H. Braggs, banjo; Charlie Dixon, bass; John Humphries, drums; Kellough Jefferson, vocal. I wonder why this side stayed in the can...it's pretty good. Sadly, nobody guessed Joe Mooney (1911-1975)...actually, nobody guessed anything at all. It must be a busy time for the regulars. Mooney is one of my favorite vocalists...there is nobody who sounded quite like him. I've heard that Sinatra and Bennett considered Mooney one of the very best as well. 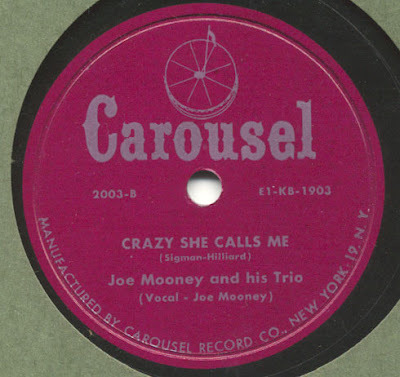 Hackensack NJ 26 May 1951: Joe Mooney, vocal & Hammond organ; Bucky Pizzarelli, guitar; Bob Carter, bass. The reason this record is special is revealed by the Hackensack location...it's from the first issued session recorded by the legendary Rudy Van Gelder. Mooney started in the late 1920s playing piano and singing backup for his brother Dan in a duet called The Sunshine Boys (not to be confused with the country group, of course! )...they made quite a few records together, often backed by the Dorseys. Both Mooney boys had congenital blindness, but that didn't stop Joe. He went on to arrange for Paul Whiteman (although I'd love to know which charts were his...Rust's Dance Band Discography mentions his accordion appearing on some of Pops's Decca sides), he's apparently on a session or two by Buddy Rodgers in the late 1930s too. From 1946 until the 1948 recording ban, he was at Decca leading a very innovative quartet, featuring himself on vocals and accordion, and Andy Fitzgerald's clarinet. 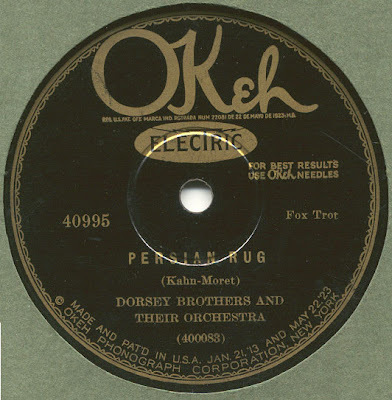 These Decca sides sold moderately well, but Mooney couldn't get gigs outside of NYC so the group eventually folded. Those Deccas were vocals that really didn't show all that the group could do...the Hep Label has two terrific CDs that fill the void. All of the group's issued sides are therein, along with a nice selection of airchecks...some of which are instrumentals. Mooney passed through the Sauter-Finegan orchestra in the early 1950s, scoring a rather big hit (#13 on the Billboard Charts) with Nina Never Knew. In 1955, he recorded the Lush Life album for Atlantic...Mooney sings and plays organ here. Koch has reissued it. The last two albums that Mooney recorded were for Columbia in the early 1960s, accompanied by a swinging studio orchestra...and there are occasional solos by Mooney on piano, accordion and organ. His singing was great here too. Koch reissued these LPs on one CD too. Someday, I've got to put together and post a sampler of Mooney's work. Most of his material is available, but he's still not too well known, at least to the general public. Too bad. He deserves more acclaim. That should nail things down for this installment...until the next time.